I added pictures they they are not very good I hope this one will show up better. Anyway, this is the after the work was done on it. Love your bike and the color. That looks like a lot of fun. 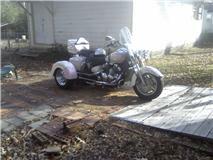 She is a 98 Yamaha Royal Star 1300. I am really proud of her. I started out with a Road Star Classic 650. I kept it about a year and decided to go larger so I could run with my husband. I posted before and after pictures. It looked pretty good when I bought it but I wanted a females bike and did not want it to look like so many on the road. Love your ride; it's lovely. What are the specs on her? Type? Size? Year? She's a real beauty! You should come on one of our female-only motorcycle tours with that lovely beast. We are Biker Babe Tours (bikerbabetours.com). Would LOVE to meet you and your machine on a tour. I ride a 2008, purple Harley Softail Custom. I always rode Hondas prior to the HOG. My Harley is the best decision that I ever made (other than marrying my best friend and hubby, Craig!). Sweet ride! Mind if I borrow it ;) ? Just kidding. Looks great! Have fun!